And here's how NARS Albatross looks worn over a matte blush (Illamasqua Tremble). It's very subtle, just the way I like it. 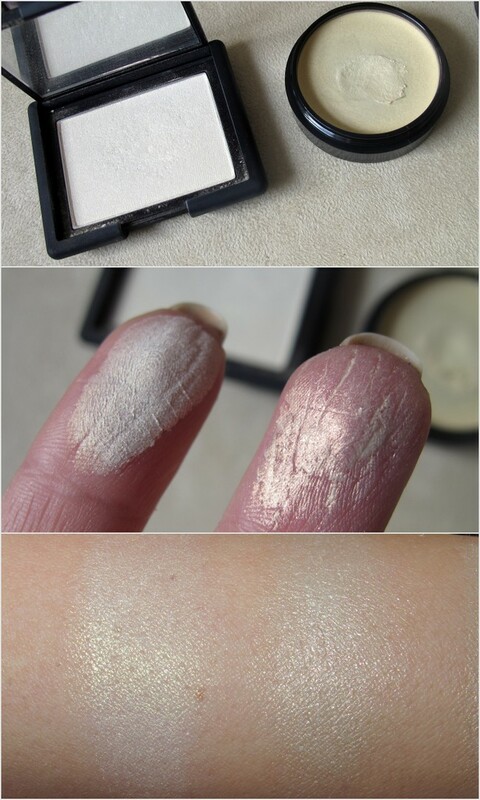 What do you think of these highlighters? Do you have a favourite? I adore anything that makes my skin glowy, I buy pretty much anything that falls into this category! so pretty! I want to try Albatross!!! I am using mary loumanizer now! This is exactly what I've been looking for!!! Hello, thanks so much for your comment. Re foundation recommendation, I have very dry skin all over (no oily T zone like you) and I've been using the Maybeline Dream Matte Mousse foundation. I'm planning a review on it soon, but it's seriously very good. Keeps my skin shine free but natural looking. Even on the really dry areas of my skin it still looks good. Hi Lilit, these both look like beautiful highlighters and I totally agree with you that some can interfer with blush colours and even foundation. Do you have any thoughts on what type of brush is best to apply a powder highlighter with?